Today I will continue to talk about Norwegian costumes, or Bunads, referencing in particular the most common version of the costume of West Telemark. This is the Bunad which I have, and on which I did the embroidery. 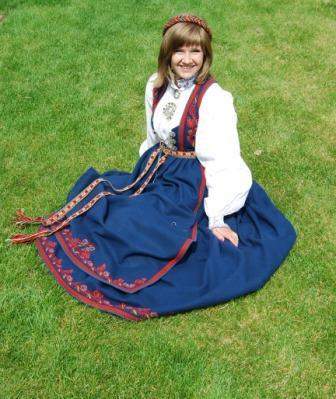 The photo above is from a workshop on Norwegian dance which took place here in Omaha. 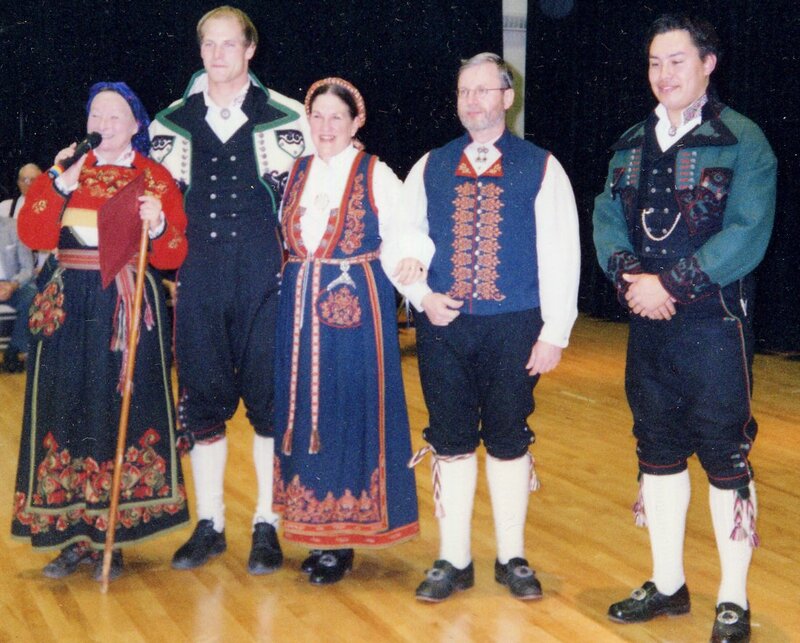 The two people on the left and the man on the far right are wearing East Telemark Bunads, The woman on the left is Karin Brennesvik, a world famous teacher of Norwegian dance She was teaching a workshop with the help of the young man next to her. 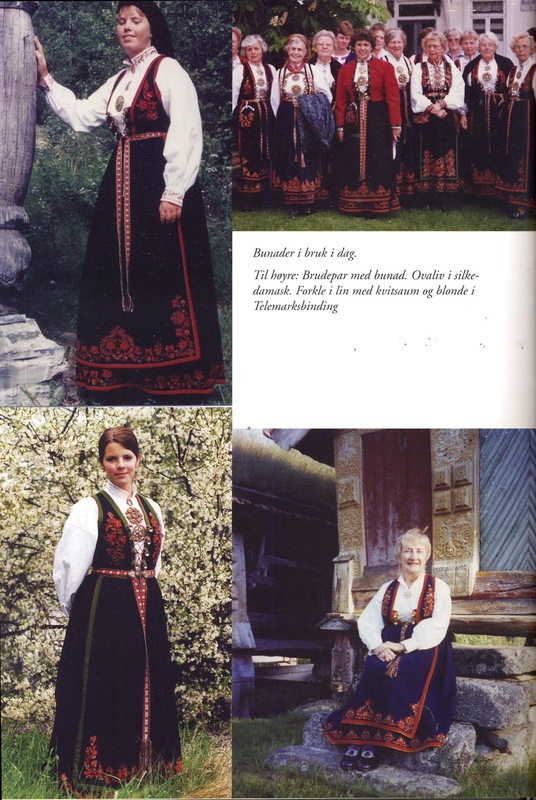 I am in the center with a friend of mine wearing West Telemark Bunads. 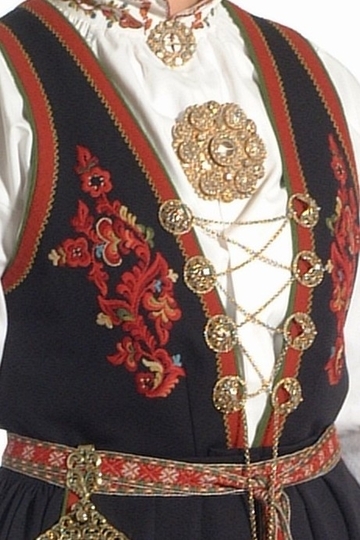 You can see the typical Telemark style embroidery on the costumes. 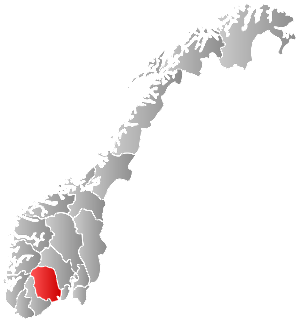 Here is a map showing the location of the province of Telemark within Norway. Here is a map showing the local regions of Telemark. There are basically three geographic variations of the Telemark costume, East Telemark, West Telemark, and Tinn, in the northeast corner. 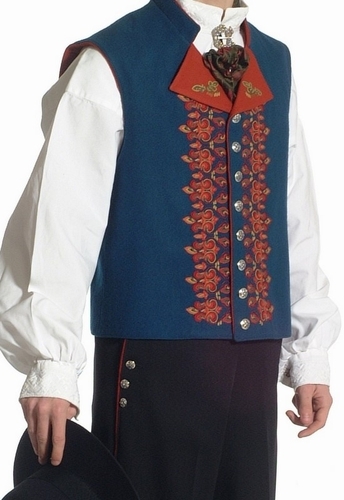 I will cover one version of the West Telemark Bunad today. 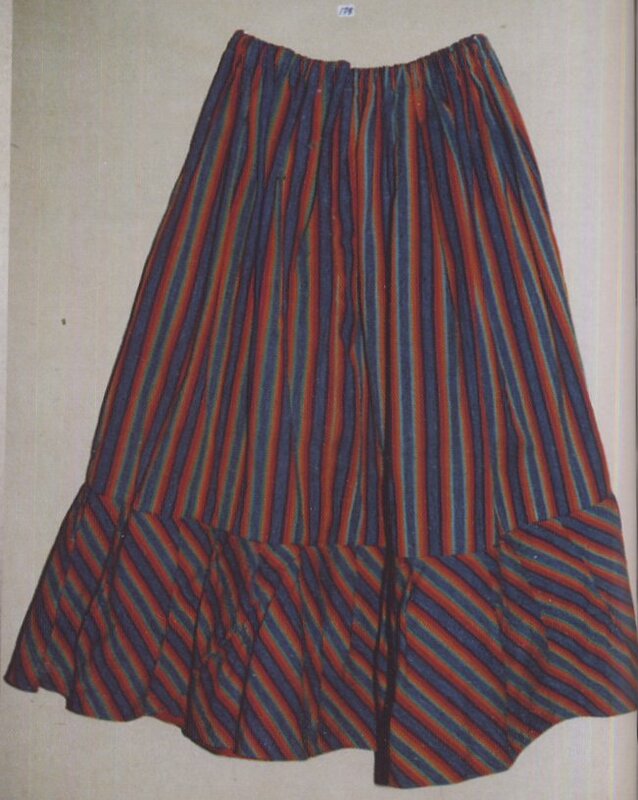 This most commonly seen version today is a revival of the costume from the early 1800's, before 1850 or so. 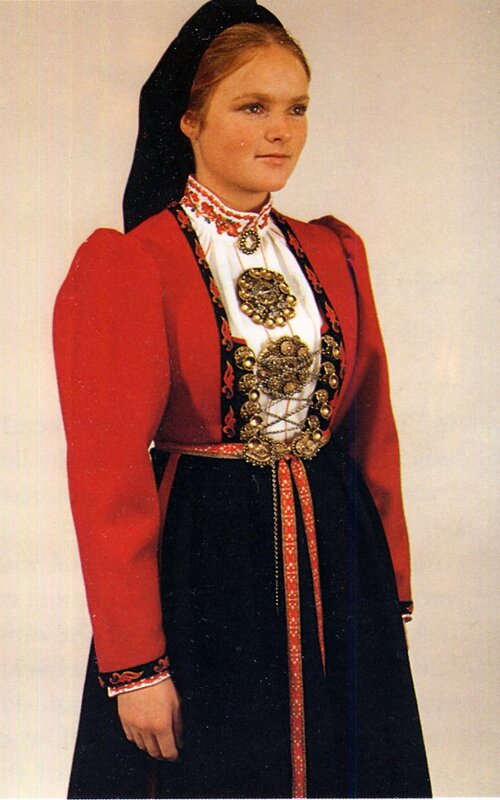 Some form of the Telemark Bunad continued to be worn until about 1915, about when Norwegians began to take an interest in their costume tradition. Thus Telemark, unlike many places in Norway has a rich costume heritage which is well attested. Other such areas are Hordaland, including Hardanger, Setesdal, Hallingdal, and Gudbrandsdal. 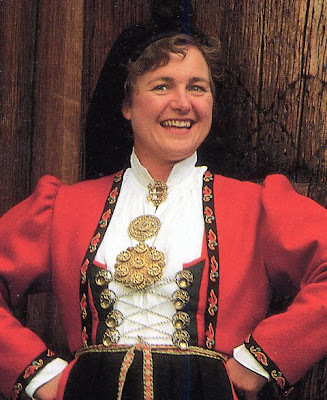 The costume of West Telemark is much more typical of Norwegian costumes or indeed of Scandinavian costumes in general than is that of Hallingdal, which I covered in my last posting. 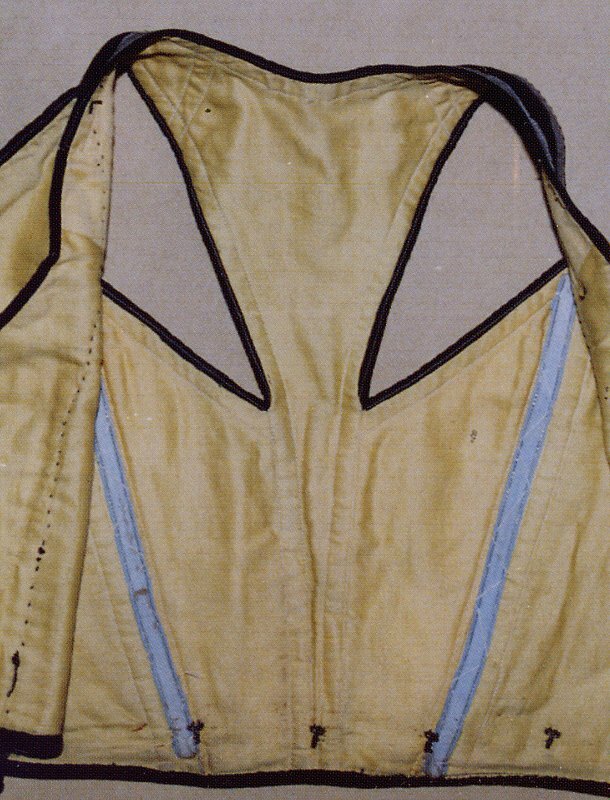 It consists of a bodice, Liv, which in this case is attached to the skirt, Stakk. Over the skirt is worn an apron, Forkle, fastened with a sash, Belte, Hanging from the sash is worn the purse, or pocket, Løslomme. Underneath is worn a linen shirt, Skjorte, which was originally a full chemise, but today is usually worn as two pieces, a shirt and a linen shift. 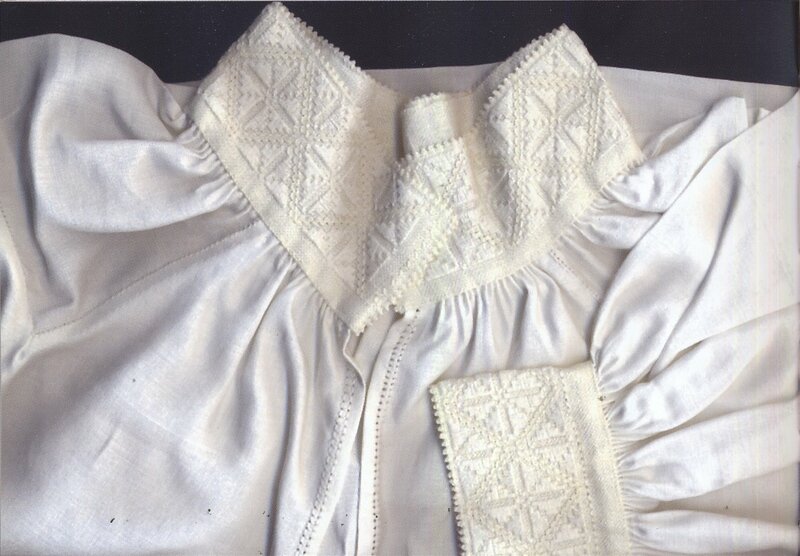 There is a wool underskirt, understakk, worn over the chemise or linen slip. There is a jacket, Troye, red for women and natural white for men. 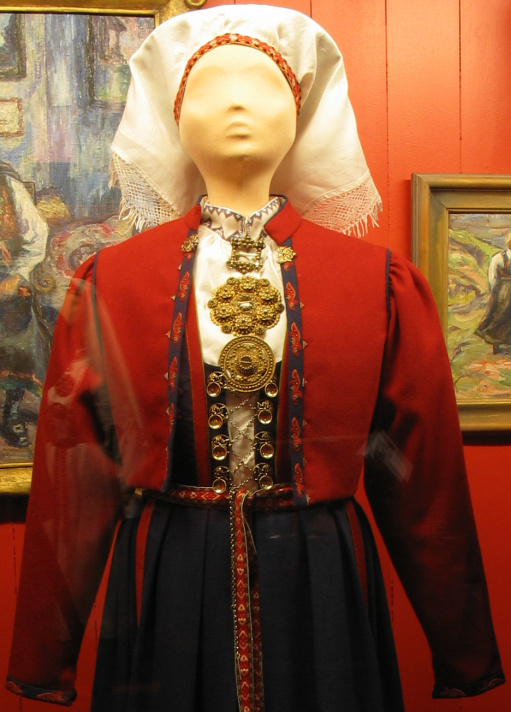 Several pieces of costume silver, Bunadssølv, are worn with this costume, as is true for most Norwegian Bunads. There are a couple different headdresses, and often a cape is worn with this costume. 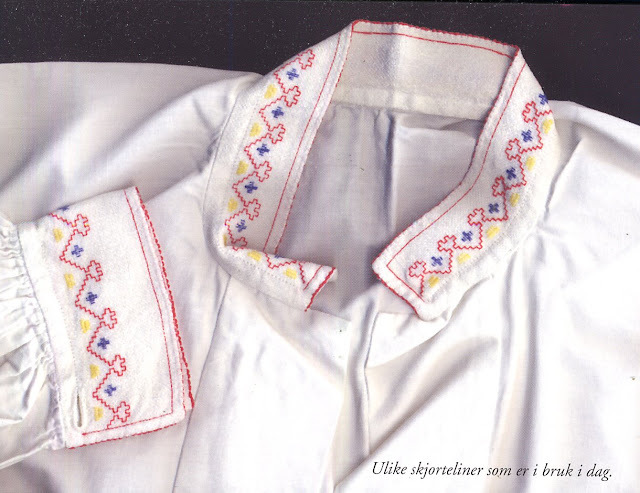 The skjorte, the shirt, is made of linen, with a rather unusual cut, a rectangular shoulder piece is inserted into an opening made with a T shaped cut the sides of which are then turned 90 degrees. The collar and cuffs are embroidered. 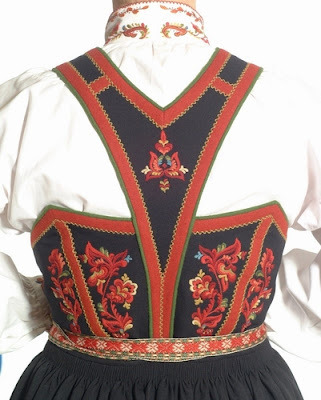 The range of embroidery designs, while not as great as in East Telemark, is still quite wide. One option is white counted-thread embroidery such as is found all over Norway, and indeed, over most of Europe. Here are a couple of examples. 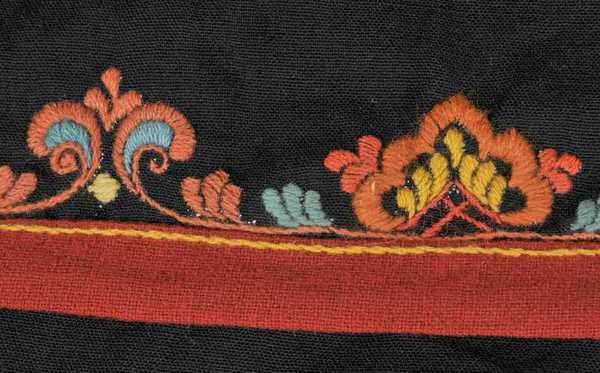 If there is embroidery on the men;s shirt, it is most commonly of this type. 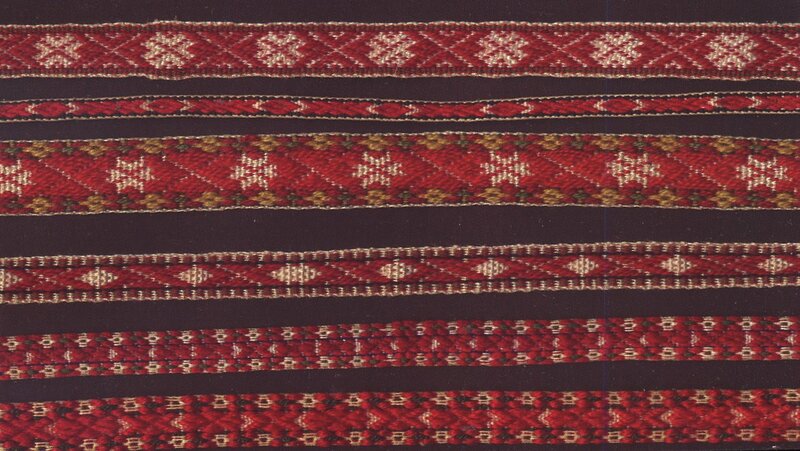 Another option is colored counted thread embroidery, often of cross stitch. 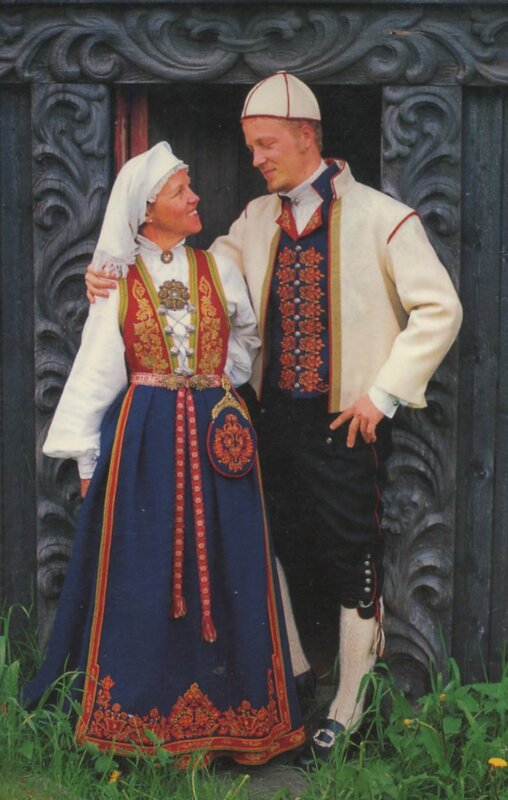 What is most commonly seen, however, is Telemark style 'Rosemaling' embroidery in cotton. 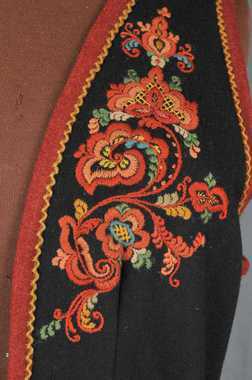 This may be in a variety of colors, as it is on the wool parts of the costume, purely in shades of red, or in a combination of red and blue. 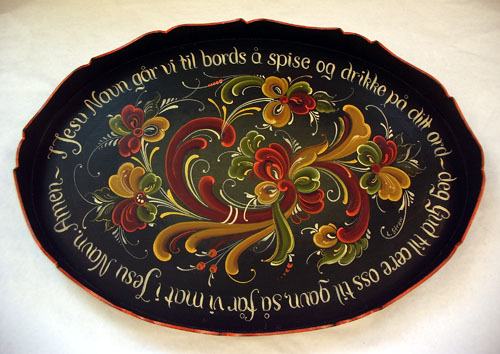 Rosemaling [rose painting] is a type of folk painting which is common all over Norway in various styles. That found in Telemark tends to be in subtle, subdued colors which have a quiet beauty. 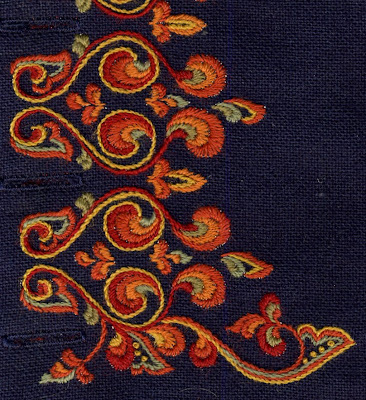 This has carried over into the embroidery which is loosely based on the painting style. 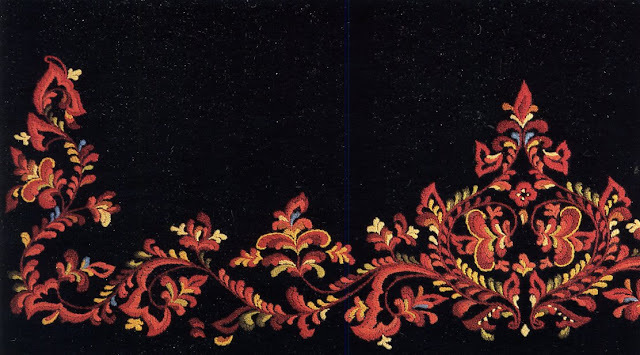 Here is a piece done in traditional Telemark Rosemaling. 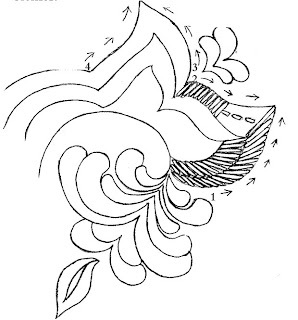 The embroidery style is actually called rosesaum or rosesøm, [rose stitching]. 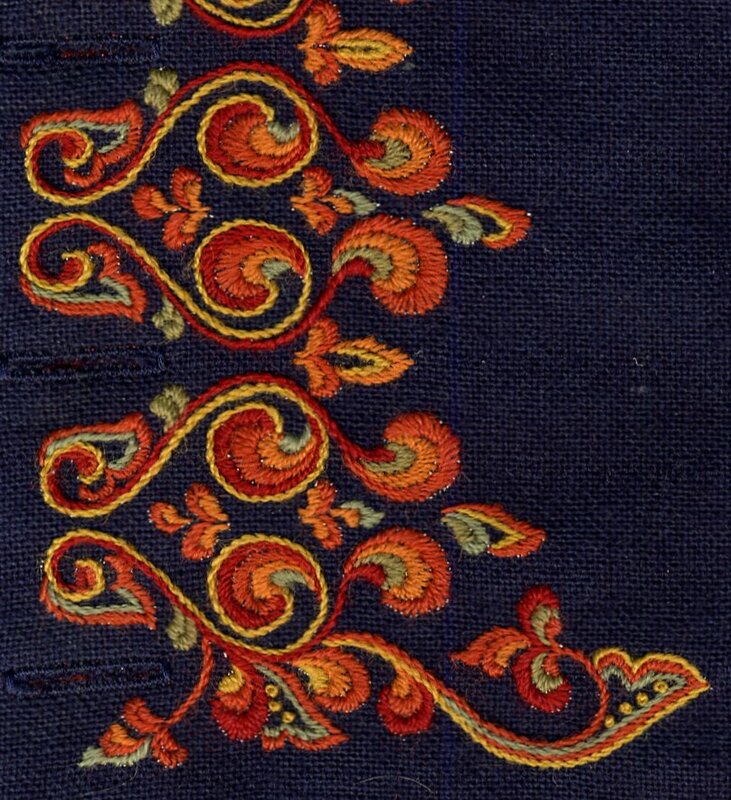 Here is a closeup of the embroidery which I did on my vest. I ordered a kit from Norway, and spent about a year doing the embroidery. This image is shown larger than actual size. 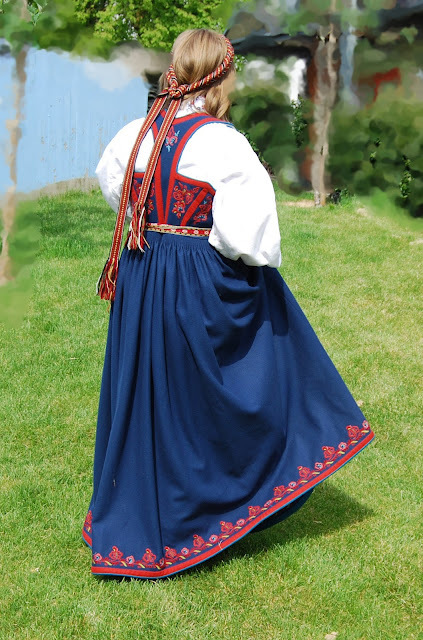 Under the skjorte is worn a shift, or slip of linen or cotton. 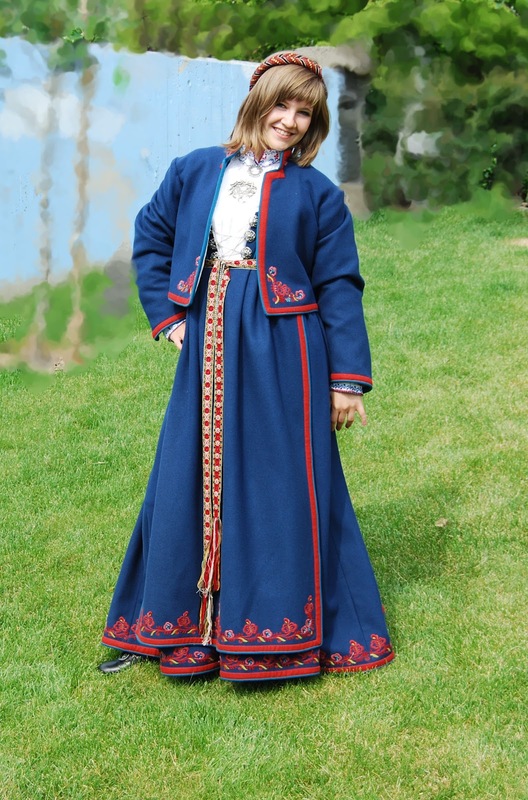 Because the Bunad itself is made of heavy wool, in Norwegian called Wadmal, this makes the outfit more comfortable, keeps the wool from needing to be cleaned, and gives shape to the ensemble. 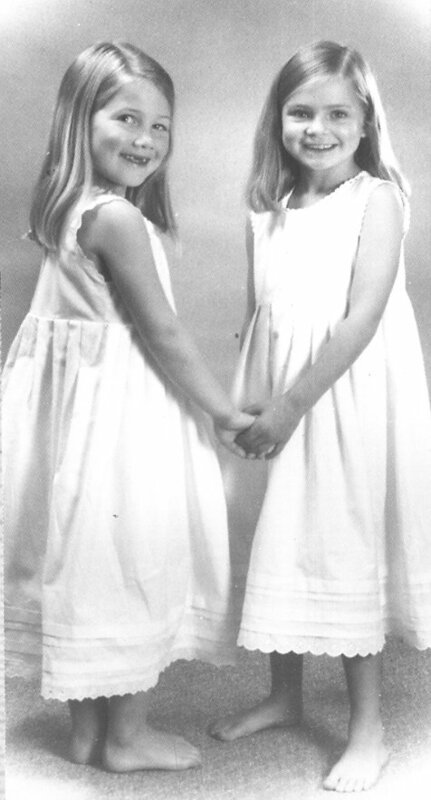 Here are a couple of girls showing us what they look like. 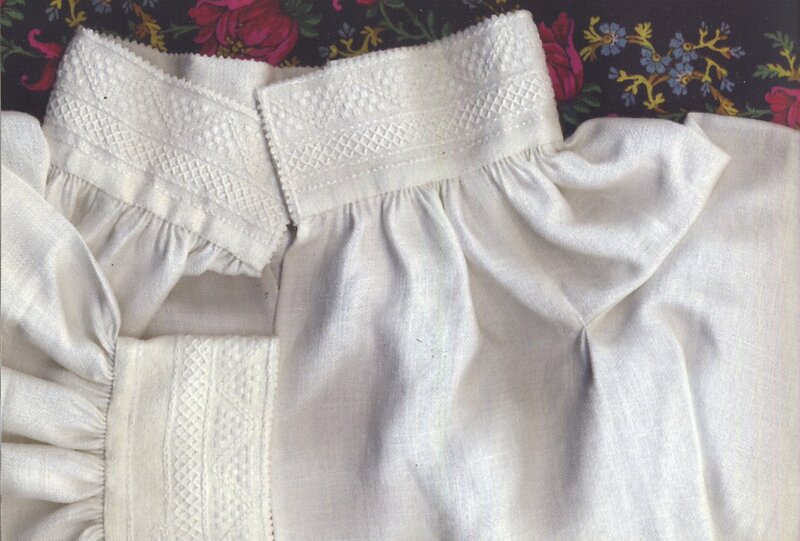 Underskirts of wool are worn over the shifts. They are commonly brightly colored, often red, so as to flash when moving or dancing. 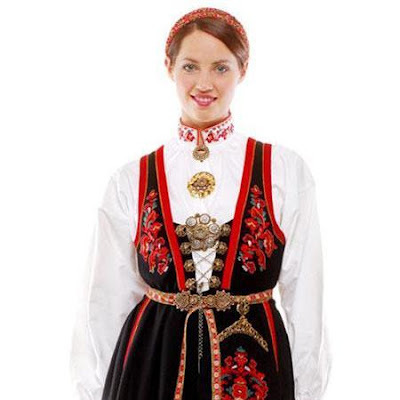 It is likely that the belief that red flannel protects the wearer was also found in Norway. Here are a couple of examples. The underskirt may have a flounce. 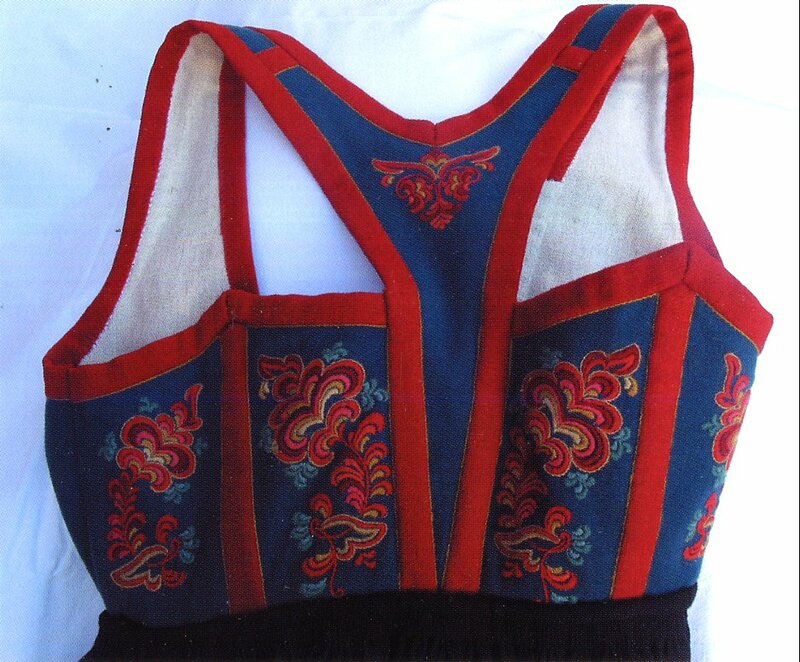 The bodice and skirt are made of wool, most commonly in dark blue, but also in black or red. They are attached in this costume. The bodice is laced up the front with a silver chain. There may be panels which hold the loops for the chain, or not. 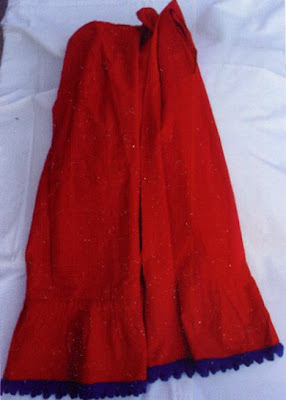 The bodice may be the same color as the skirt or not. There is a contrasting band sewn onto the hem of the skirt. There may be embroidery above this band as well. The cut of the back of the bodice is unique to West Telemark, and is very attractive. 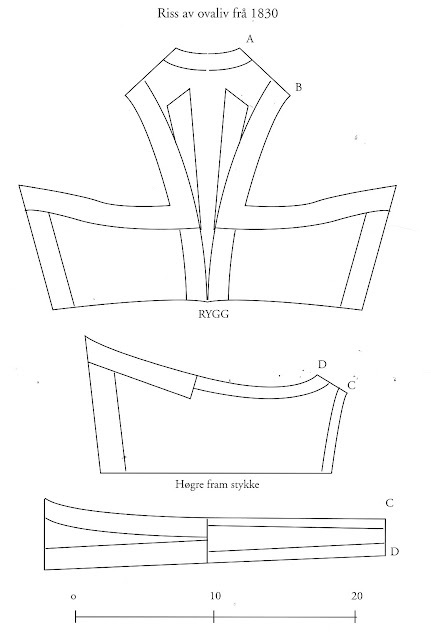 This schematic is copied from an original bodice from the 1830's when the fashion was for the empire waist. They are now worn at the natural waistline. There is boning in the back side seams to keep the point standing upright. 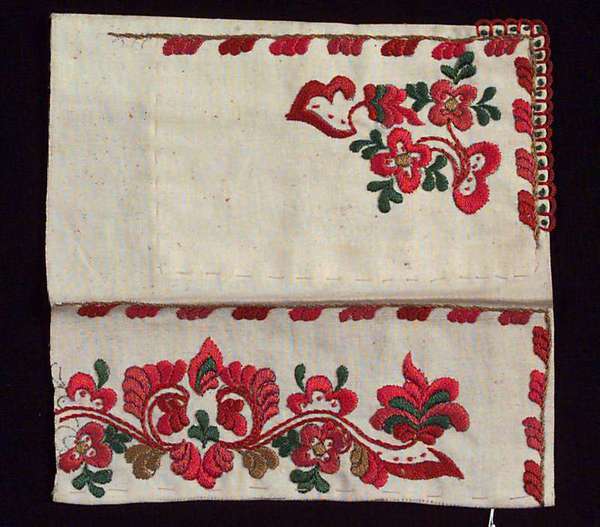 The apron is rectangular, with contrasting wool strips along the borders, and Rosesaum along the bottom, and softly gathered at the top. 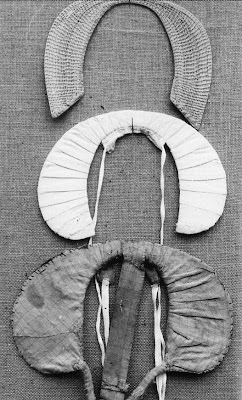 Attached to the apron is a narrow inkle-woven band, which wraps around and is tied or buckled in front with the ends hanging down. 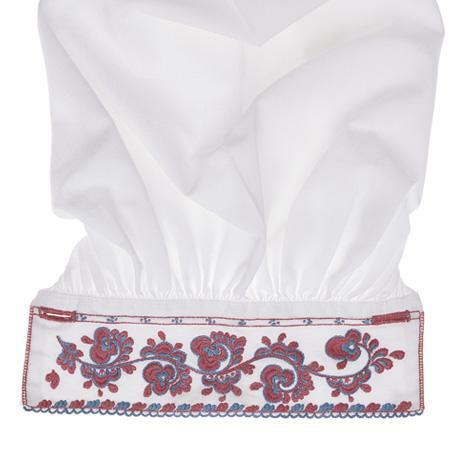 It finishes the waistline like a sash, and has a design woven into it. 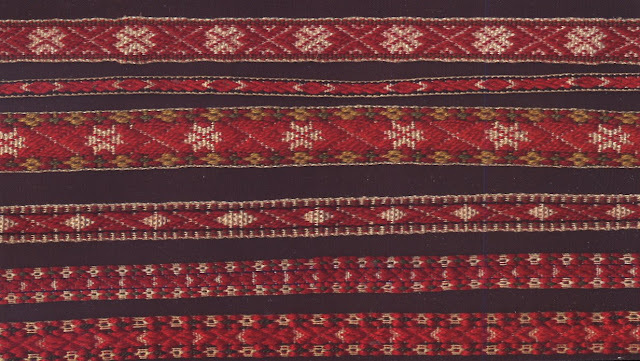 Similar sashes are woven and worn by many of the peoples of Northern Europe. Hanging from this band is the purse or 'loose pocket', Løslomme. The silver fittings for these are specifically designed by jewelry makers of each region, and are considered to be part of the 'Bunad Silver'. 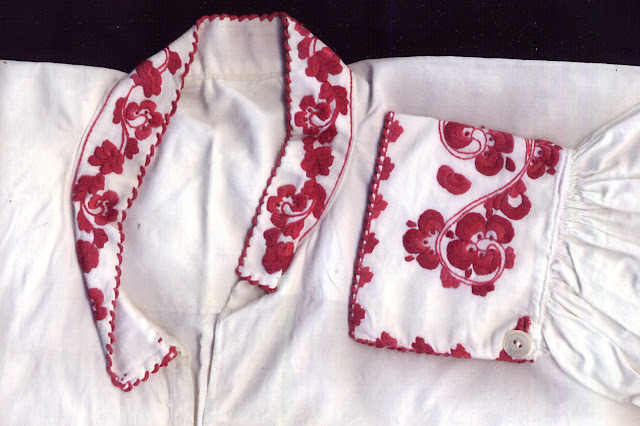 Rosesaum is found on the pocket, apron, skirt, bodice and man's vest. 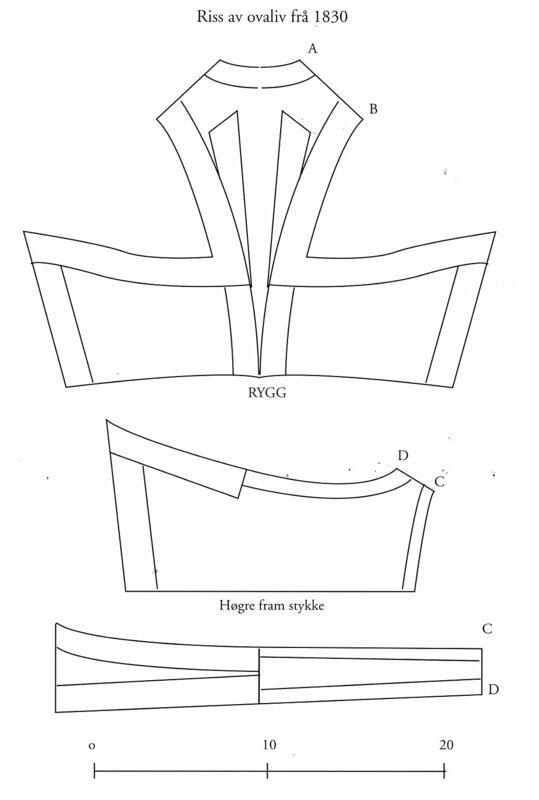 Since many Bunads are reconstructions, it is not uncommon for there to be only one correct embroidery design. Thankfully in Telemark this is not the case; there is much material in existence, and the style is well enough defined that new designs are easy to make. 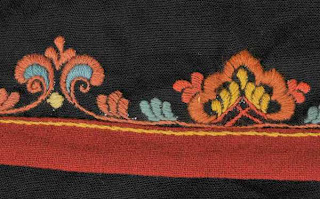 The embroidery is based on stem stitch and satin stitch with a few french knots here and there. The main color is generally red in various subdued shades with accents in yellow, green and blue to round out the palette. 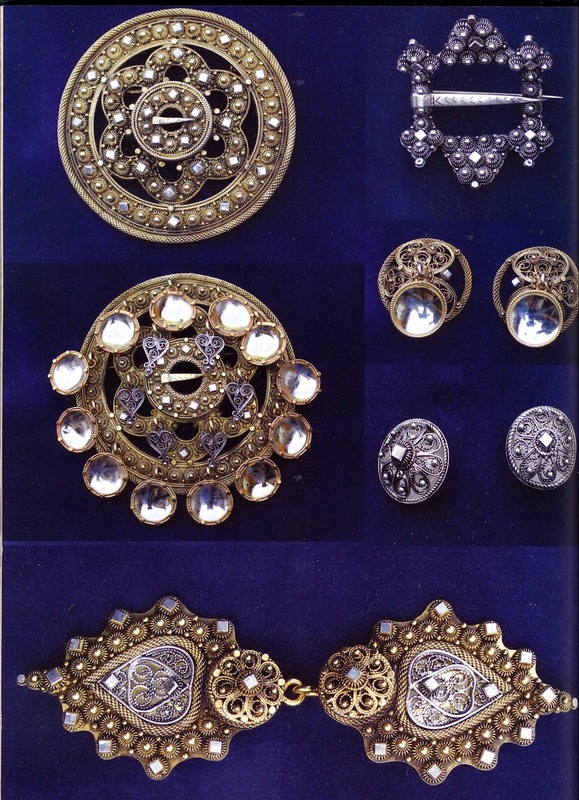 Here are some more examples of the embroidery. 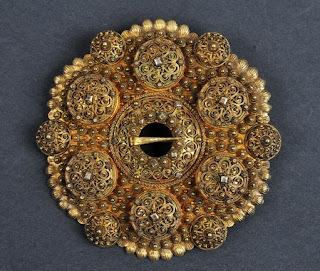 The motifs are generally quite fine, and embroidered with very thin strands of wool. 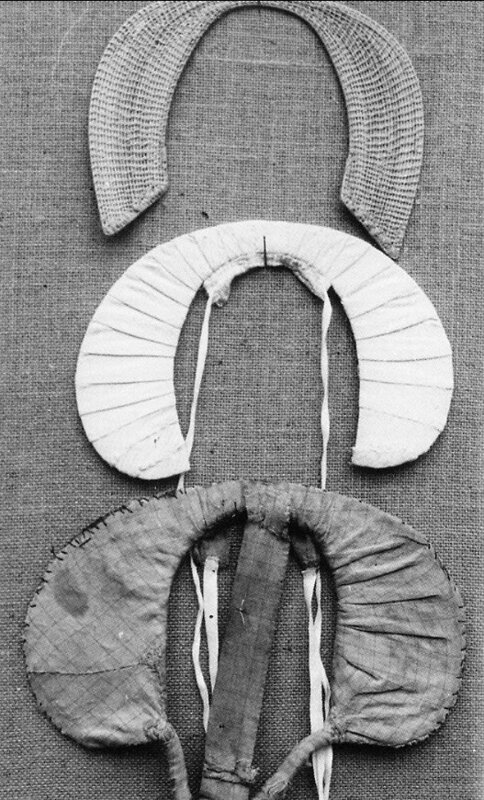 Girls wear a headdress of two cords wrapped with the same inkle woven bands as are used for the apron ties. I strongly suspect that originally the bands were wrapped around two braids of the hair itself, as is still seen in other places. The ends hang down in back. 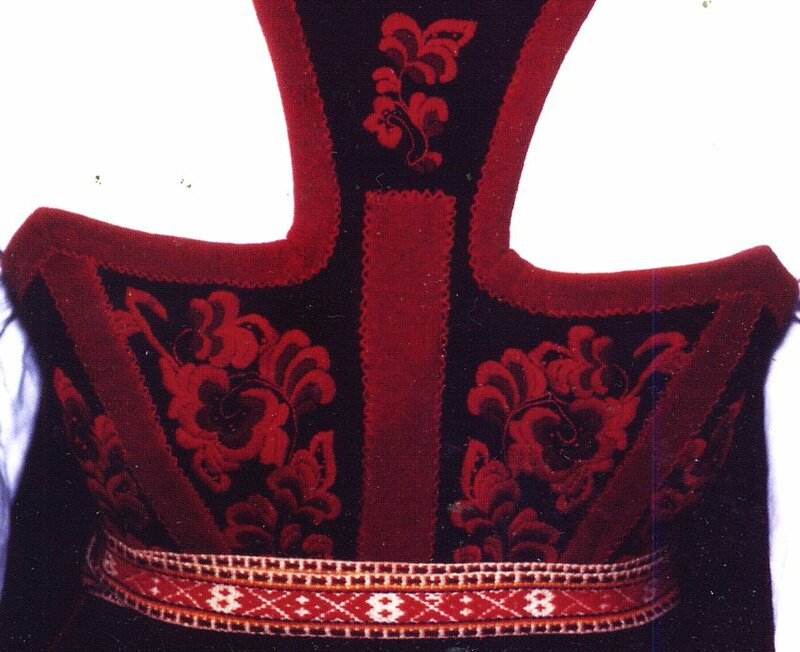 You can see that they are wearing this in some of the images above. The headdress for married women consists of a halo type padded base of wicker or some other light material attached around the head with a kerchief tied over it. 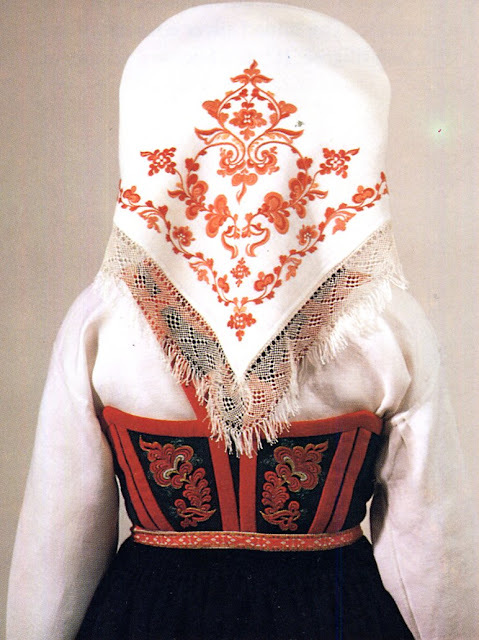 The kerchief can be black silk or white linen. 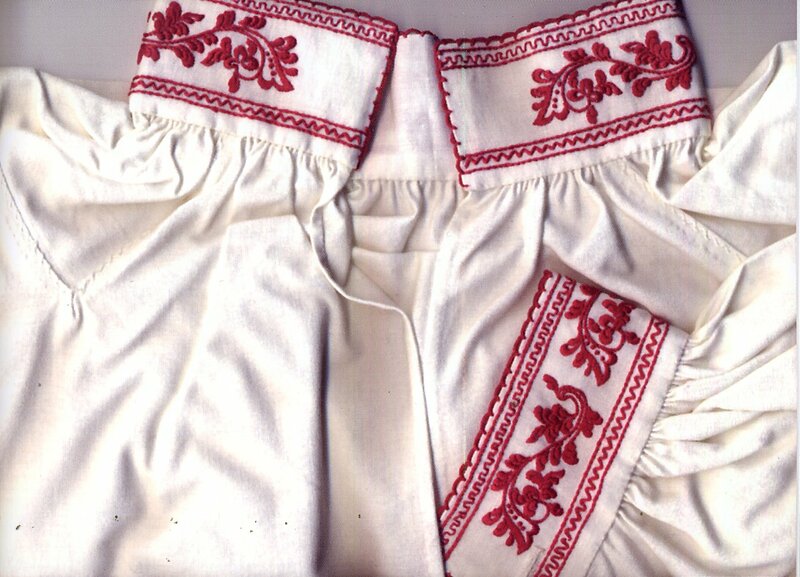 The white kerchiefs are often embroidered. 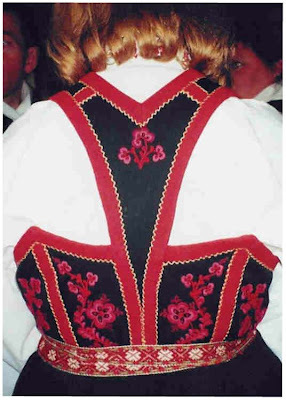 You will sometimes see the kerchief worn without the frame, wrapped around the back of the neck and tied on top to imitate the shape of the frame. A red jacket which is open in front, the Rundtroye may be worn at need. 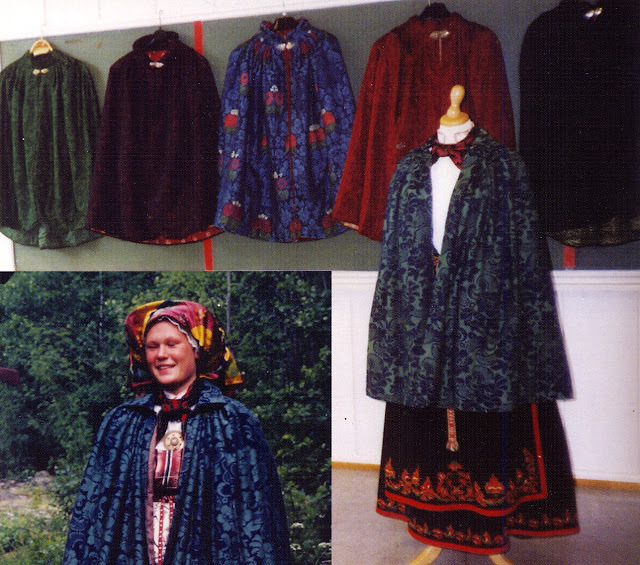 Brocade capes are worn with the Bunad at need. These may be in almost any color. 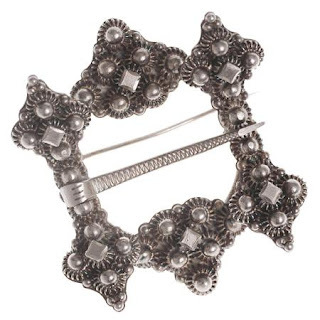 The costume is not complete without the silver, the sølv. In Telemark this is often gilded, and in a particular filligree style. 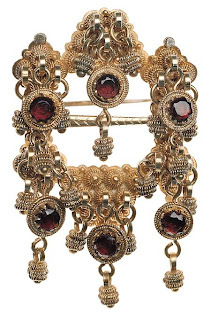 The jewelry includes the neckpin, which holds the collar of the shirt closed. In most of Norway it is round, but in Telemark is often square. The fist one shown is for a man, the second may be for either a man or a woman, and the third, with the dangles, is generally for a woman. 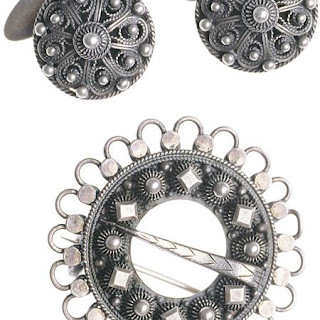 cufflinks hold the cuffs closed, and are worn by both sexes. 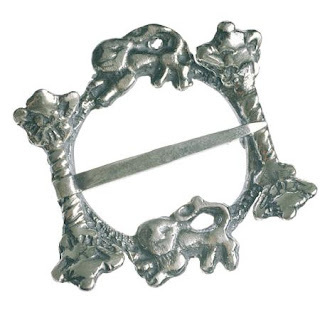 Buttons on the man's vest may be made of this same filligree. 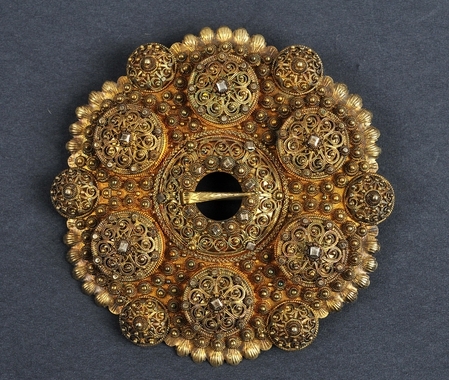 The woman generally wears one or two large brooches in the front. 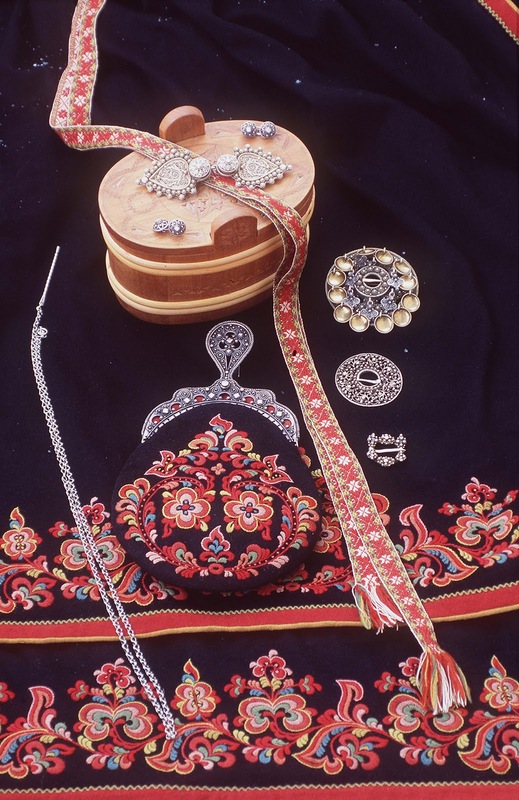 The eyelets on the bodice, the purse fittings, the optional buckle for the 'sash', and the silver buckles on the shoes are also part of the Bunad Silver. The men may wear a knife with silver fittings hanging from the waist, or a watch chain. Thank you for reading. I hope that you have found this interesting and inspiring. 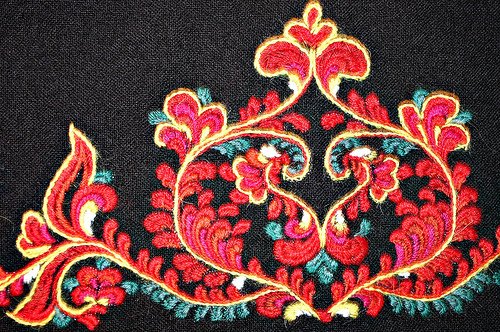 This type of embroidery is well suited to many types of projects. I encourage you to design and create a cushion or other to bring some beauty from Norwegian culture into your life. 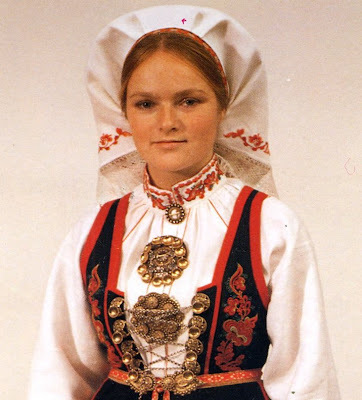 Here is another, this first link is for the woman's bunad. 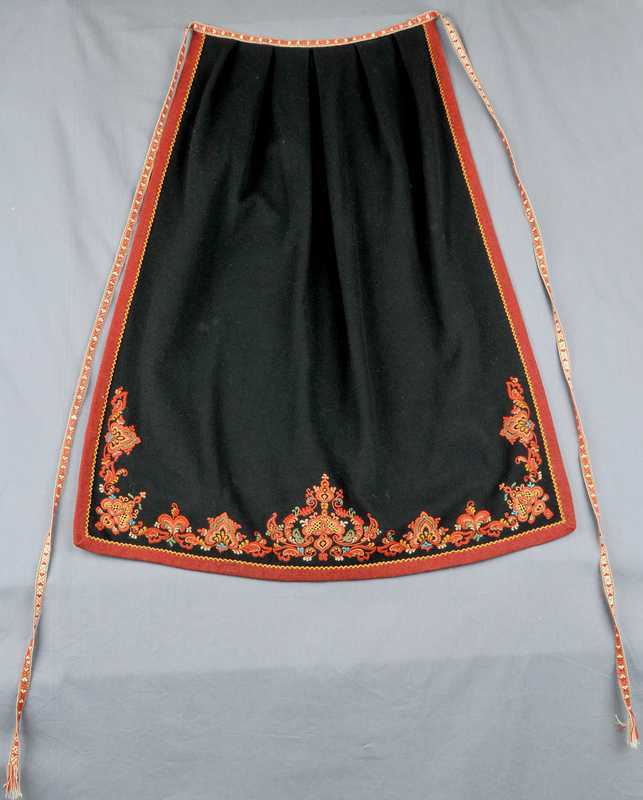 Do you have any idea where I could find patterns for the embroidery? 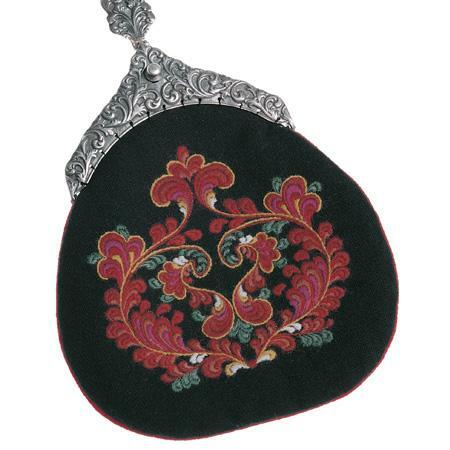 I am not prepared to start a whole bunad (a bit rich for my blood), but, as a proficient needlewoman, I would really love to try my hand at the rosemaling embroidery. I do not know of any books which show graphed designs. 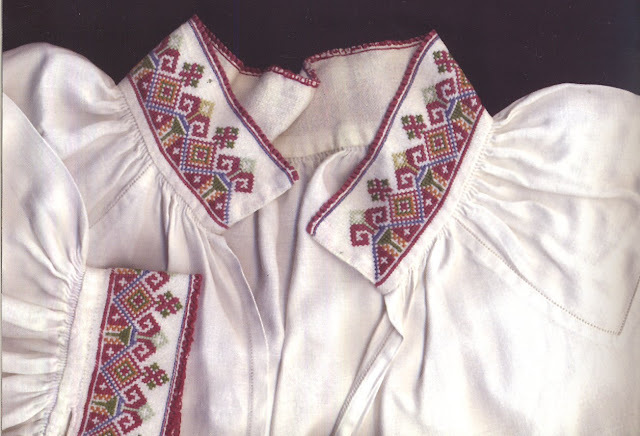 Bunad companies do provide kits for clothing items such as blouses which have the designs pre stippled on them. You could contact the links in this article, or research others, English is widely understood in Scandinavia. Alternatively, some of the images in this blog entry are quite large, you can click on them and copy the designs freehand or make your own composition from the design elements. This is a marvelously complete look at the bunads from this area- thank you for posting it! 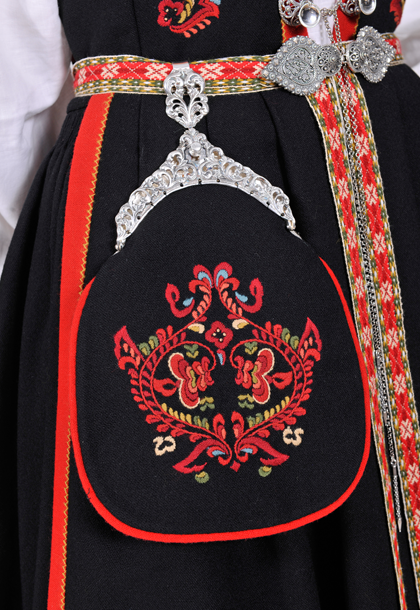 I am also interested in the ones from Tinn, as the embroidery is different and the bunad itself is unique. 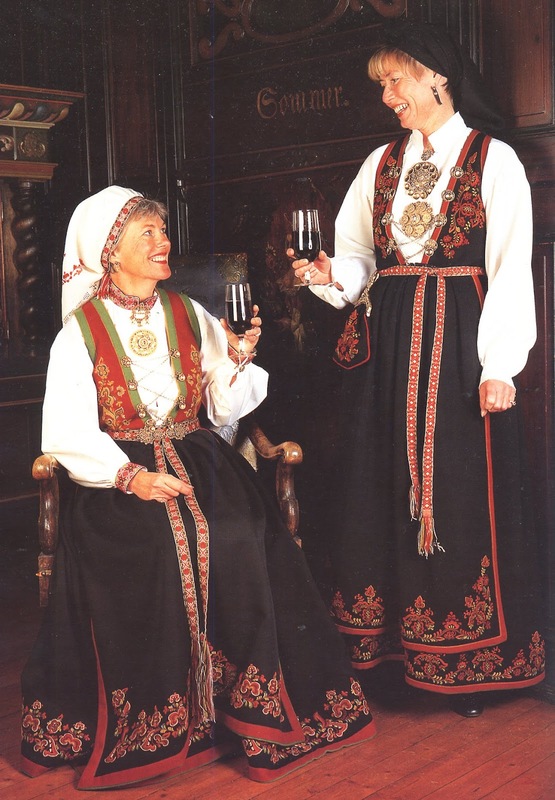 Any chance you might do a post like this on the bunad from Tinn? Thanks, and beautiful work!! Thank you for your input You are, of course, correct. I am afraid that I oversimplified for the sake of the article. I will try to make corrections that clarify that point. I am glad that you took the time to read my article and I will take a look at the website to which you provided the link. Thank you very much. 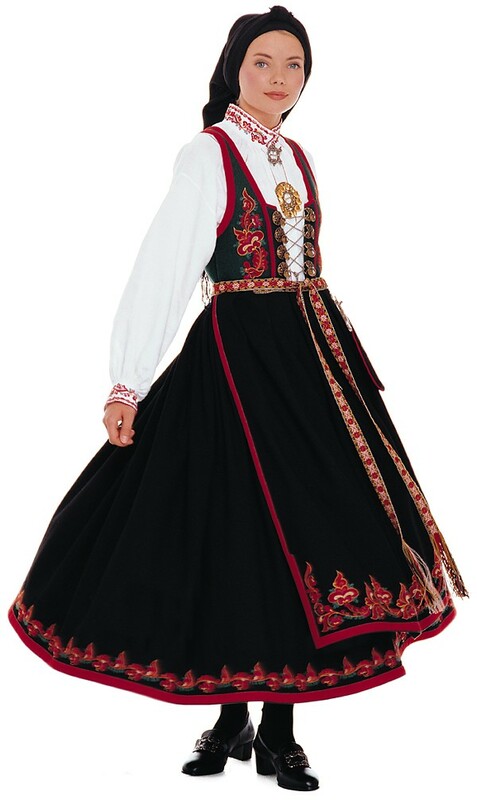 Norwegian costume pieces are easy to obtain, but they are expensive. Do a google search for Husflid. Here is one such company's website.